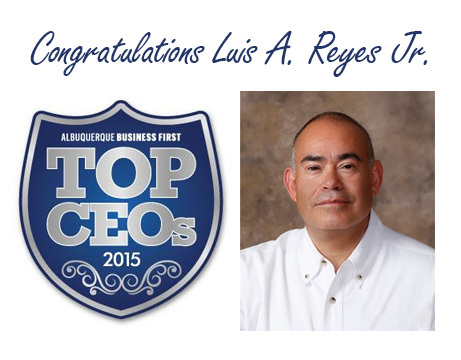 September 14, 2015 – Kit Carson Electric Cooperative (KCEC) CEO- Luis A. Reyes Jr. received the prestigious 2015 Albuquerque Business First Top CEO of the year award. The Honorees came from a variety of industries including business services, health, nonprofit and technology. Out of the 20 honorees, Luis A. Reyes Jr. will be recognized in the business services category. The CEOs were nominated by the public and then asked to submit an application with information about personal achievements, leadership and community involvement. The applications were then evaluated by Albuquerque Business First judges. The judges this year were Margaret Lewis Meister, lawyer at Modrall Sperling; Mary Martinez, franchise owner and CEO of Home Instead Senior Care; Chris Dunkeson, area vice president of Comcast Cable; Rebecca L. Avita, executive director at the National Hispanic Cultural Center; and Stacy Ertle, director of Bridges Inc.
KCEC CEO-Luis A. Reyes Jr. said in a statement after the announcement on September 3, 2015 by Albuquerque Business First “I am completely humbled and honored to have been nominated and selected for this prestigious award, and with complete acknowledgement that a large contribution to my success over the years as CEO is owed to the 121 managers, linemen, installers and staff support that make up the Kit Carson family of companies, and as CEO I am blessed to have a great team to work with on a daily basis”. CEOs and high level executives handle a lot of responsibilities and work — some high-profile and much behind the scenes. Albuquerque Business First recognizes the ambition, effort and time these leaders put in every day through our Top CEOs awards. The awards ceremony will take place Oct. 22 at the Albuquerque Convention Center for the Top CEOs Networking Reception & Awards Luncheon from 10:30 a.m. to 1:30 p.m.
Taos, NM – May 8, 2015 – Kit Carson Electric Cooperative received the prestigious 2015 Utilities Telecom & Technology APEX Award at the organization’s annual UTC Telecom & Technology awards banquet in Atlanta, GA. The Apex award is the most prestigious award the organization offers, and it pays tribute to the critical role of information and communications technologies in delivering essential energy and water services to communities throughout the world. The award recognizes that in emergencies, utility communications technology saves lives, protects property, speeds restoration, and puts communities on the path to recovery. In normal times utility communications provide opportunities for communities to enhance economic prosperity, provide innovative new services, and support health, education and access to critical services. The fiber network helps create Internet-based opportunities and drives economic development among businesses, households, community anchor institutions, and two Native American pueblos. The co-op got involved with, and eventually helped make successful, various local economic development projects in its three-county service area, establishing a track record of success that brought additional credibility to the public positions it took. By working in the communities it serves, evangelizing the benefits of broadband and supporting projects that facilitate job creation, the co-op built a strong contingent of on-the-ground support from its customer base and local elected officials. Implementation and rollout began in the fall of 2014, making KCEC the first ISP in northern and central New Mexico to provide 1 Gbps service. The main line construction project is approximately 91 percent complete, with more than 110 businesses and community anchor institutions connected to broadband fiber. Over the remainder of this year, the Co-Op will make 1 Gbps broadband service available in 29 communities. The state-of the-art network eventually will cover 5,000 square miles, improving customer centricity and service reliability and fulfilling Smart Grid Network requirements without requiring modifications. The network also will enable Smart Grid technologies including Substation Automation (SA) and Advanced Metering Infrastructure (AMI), which will help customers be more aware of energy usage and provide management tools. The network is secure, fully redundant and compatible with evolving technology. TAOS, NM – April 24, 2015 – On Earth Day, Kit Carson Electric was awarded the Governors Environmental Excellence Award in Energy Conservation by Governor Susana Martinez for their outstanding stewardship, conservation and positive impact on the environment. Receiving the award on behalf of Kit Carson Electric Cooperative were Board of Trustee Members and CEO-Luis Reyes. Kit Carson Electric was recognized for their energy diversity and use of sustainable energy, as ten of their current projects are solar-based, with 10% of Kit Carson’s total electric capacity being derived from solar. Kit Carson Electric has been awarded the prestigious 2015 Cornerstone Award by the Broadband Communities Magazine. The award was presented in Austin, TX on April 15th, at the Broadband Communities Magazine Annual Summit. The award was given by a panel of judges including editors, analysts, fiber to home experts and other industry leaders. The judges specifically recognized Kit Carson’s infrastructure as an improvement that will drive economic growth for businesses, households, community institutions and two Native American Pueblos. In addition, the judges noted Kit Carson’s planned smart grid, with an advanced metering infrastructure and real-time detection of power outages. Kit Carson Electric Cooperative in Taos, New Mexico, is the Nova Award recipient for efforts to improve safety and create new economic, educational and technological opportunities for disadvantaged towns of North Central New Mexico. Kit Carson officials are working with government and civic leaders to help build strong and vital communities and improve the quality of life for residents.In anticipation of electric deregulation, Kit Carson Electric officials undertook a business diversification strategy to create separate Telecom, propane gas, Internet and economic development divisions. The co-op’s efforts have helped to raise propane safety standards for residential and public buildings, expand Internet access for schools, improve local phone service, and boost economic activity in the community. At the same time, Kit Carson continues to improve electric service for member-owners. The co-op passed along $2 million in savings to member-owners through lower rates over two years. Kit Carson Electric has been recognized with the Pinon Award by Quality New Mexico and its New Mexico Quality Awards (NMQA) program which is modeled after the National Malcolm Baldriage Program, for the commitment to the use of quality concepts and principles toward ever-improving customer value. Senior management at Kit Carson Electric cooperative had to complete and submit an organizational profile, and undergo an assessment to determine the strengths and gaps of the cooperative; which was completed during the month of June 2004. Kit Carson Electric was recognized as making the commitment to analyze the day-to-day operations to determine ways in which to improve performance within the departments. This analysis commitment is which brought KCEC the Pinon Recognition from the NMQA program. Kit Carson Electric is pleased to have received this recognition, which demonstrates and conveys our efforts put forth to offer exceptional service to our members. Kit Carson Electric is appreciative of the Quality New Mexico awards program, which has furnished KCEC with valuable professional insight on ways of offering improved quality service and guidelines on how to reduce operational costs. KCEC will continue striving to offer the most reliable and affordable service to its members. On November 1, 2002 Kit Carson Electric Cooperative was presented the VIVA award along with four other companies from the state of New Mexico. ACI presents an award to a specific company or corporation in four quadrants of New Mexico and one in the Metropolitan area.This year the Award Presentation Banquet took place at Sheraton up-town hotel in Albuquerque where over 350 people attended. Senator Pete Dominici as well as other state representatives attended the award presentation. The award reflects what Kit Carson Electric Cooperative truly demonstrates and works for. Kit Carson Electric works hard to provide reliable services, low rates, needed services for northern New Mexico and contributions to community services as well as economic development. The recipients of the award are judged on their corporate philosophy, and the vision of its future in New Mexico, the uniqueness of the company’s product or service and by leading edge attributes in human resources, technology, etc. Judges look at the long-term financial investment in its local community and the state, and examples of where the company is involved in community involvement and corporate citizenship, also long-term commitment to its employees. Judges also look at the growth in jobs and what actions the company has taken to ensure its growth and success and finally what KCEC has done to make New Mexico a better place to live. Once again KCEC and its employees are acknowledged for their contribution to New Mexico and for bringing needed services to our members while providing safe, reliable, quality services to its members.